Recently my husband and I have been watching a show on Food Network called Restaurant Impossible, and it's got us scared to death to eat out at restaurants. This scare anyone else? Anyways, even before this scare I vowed to start attempting some of our favorite foods made at home. Just think how many preservatives, etc. you can cut out doing this? I've been doing this for over a year now, and have been pretty happy with the results. Why haven't I shared this with you? I know, I'm wondering the same thing. And what better to start with than the salad and breadsticks from Olive Garden? I've had this recipe since 2008, so I apologize for the delay! I found this in Food Network Magazine, and I swear I made this everyday for a week straight I couldn't get enough. I also credit this dressing with getting my husband to eat salads! After living on this earth 28 years, I succeeded in getting him to enjoy salads. More importantly, the breadsticks. I cannot stop eating these. I will be taking the leftovers to my in-laws tonight so I don't eat every single one of them. Although similar to Olive Garden's breadsticks, they are a little different. But in a good way. They are more dense first of all, which is a good thing- the OG ones are light and fluffy almost, I'm sure to get us to continue inhaling them! This is a yeast dough recipe, but do not be afraid of it! Trust me, the fear of working with a yeast dough kept me from these babies for almost four years. When we (my mom and I) first saw these recipes we immediately planned a dinner for my mini-family. I promised to bring the salad if she made the breadsticks. That is the only time I had them. And now I'm kicking myself. They weren't that hard and are worth the effort! 1.) Make the dough: Place 1/4 cup warm water into the bowl of your mixer, sprinkle in the yeast and set aside until foamy. (note: this won't be as foamy as if you added sugar, but you should see a slight foam. ), about 5 minutes. 2.) Add the flour, butter, sugar, fine salt and the 1 1/4 cups plus 2 tablespoons warm water. 3.) Mix with the paddle attachment until a sticky dough forms, 5 minutes. 4.) Knead the dough by hand on a floured surface until it's smooth and soft, approximately 3 minutes. Roll into a 2 foot long log and divide equally into 16 pieces, or 1 1/2 inch pieces. 5.) 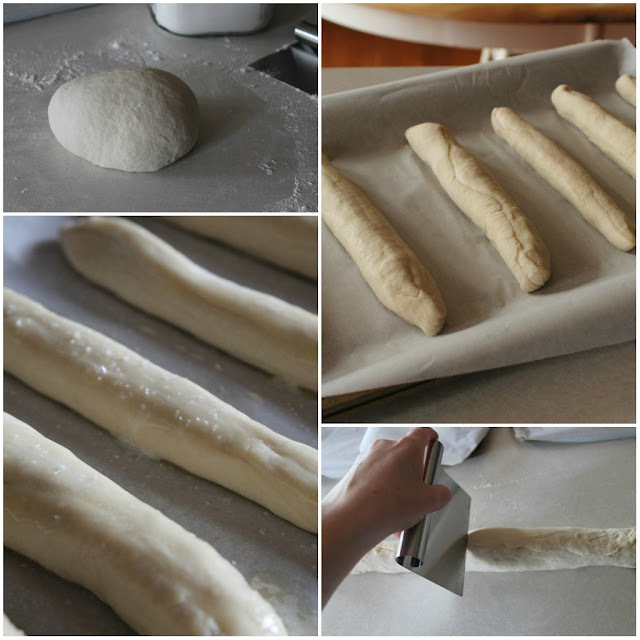 Knead each individual piece slightly and shape into a 7 inch long log and place on a parchment lined baking sheet. 6.) Cover with a cloth, store in a warm place, and allow to rise to double their size or 45 minutes. 7.) Heat oven to 400 degrees. 8.) Make the topping: brush the breadsticks with 1 1/2 tablespoons of the butter and sprinkle with 1/4 teaspoon kosher salt. Bake until lightly golden, about 15 minutes. 9.) Meanwhile, combine the remaining 1/4 teaspoon salt with the garlic powder and oregano. When the breadsticks come out of the oven, brush with remaining butter and sprinkle with salt mixture. 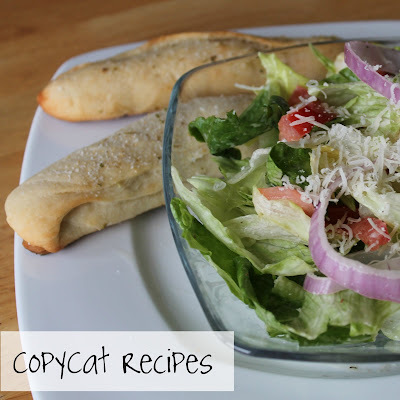 If you're making these simultaneously, make the salad dressing while the breadsticks are rising, giving you the 15 minutes while they bake to assemble your salad. 1.) 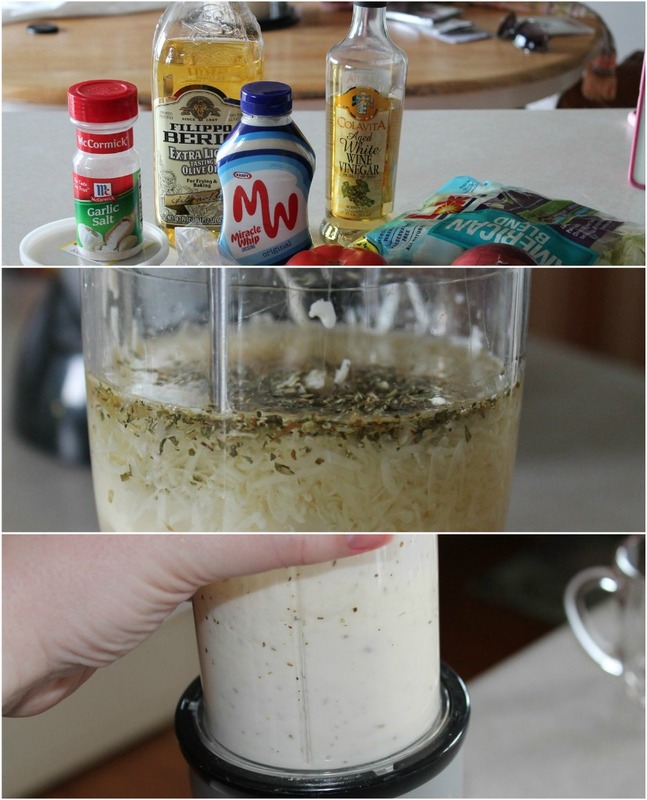 Combine all the dressing ingredients and 1 to 2 tablespoons water in a blender or food processor; puree until smooth. 2.) Place the salad blend in a large bowl and top with the remaining salad ingredients. Drizzle with the dressing. -Obviously you can tweak the ingredients of the salad vegetable and topping wise, I omitted the olives and pepperoncini and the croutons. -Kosher salt makes a lot of difference. I only started using this to cook with, and the thicker, bigger crystals are amazing on top of the breadsticks. -As you can see from the picture, I used my bullet, it's the perfect size for this amount of dressing. -I make the dressing as is, but usually am making the salad for one or two, so store the rest of the dressing in the fridge. -The breadsticks will not be perfectly shaped like the OG, but then again, who has an extrusion machine in their kitchen to make them? I think they're gorgeous rustic looking! So, what do you think? Is this a segment I should continue with? Will you make this? Oh my goodness! I just looked through some of your recipes and they all look delicious! I will be trying out several of these soon!